Despite a week’s worth of action on the diamond there has been only some minor shuffling with only two teams changing places from the entire trio of Perfect Game small-school rankings. Normally that’s usually a sign that the team positionings played out as predicted. Instead, unfortunately, it was more of a result of dozens of games across the country being canceled or postponed due to inclement weather and unplayable conditions. Nonetheless, there was still plenty of action on the diamond. Despite the unseasonable cold clubs were able to squeeze in games, even if it meant getting creative with scheduling locations and finding opponents. One refuge for diamondless clubs was Perfect Game’s own facility north of Atlanta at the LakePoint campus in Emerson, Ga. In addition to hosting a number of D-I teams, some smaller schools got a chance to play at the fields, including a matchup of top NAIA schools when Missouri Baptist exchanged 4-3 scores with the up-and-coming Bryan Lions. Should temperatures and weather continue to wreak havoc on schedules this week, look for more game-hungry schools to find alternative plans to play at fields such as the PG Complex or other accommodating facilities. Rankings are based on games through Sunday, February 22. In D-II Columbus State and Emporia State exchanged positions in the top 10. The Cougars rebounded from getting swept the weekend before by earning a handsome road win over Valdosta State and dominated Young Harris in a lopsided battle of cat-mascotted schools, outscoring the Mountain Lions 44-5 for the weekend. The Hornets on the other hand had a rough go after earning extra accolades in the PG rankings review last week. ESU dropped three of four to conference-mate Missouri Western and needed to rebound as they are scheduled to host rival Central Missouri this weekend. New to the D-II rankings this week are the St. Leo Lions and Erskine Flying Fleet. SLU upped their win total to 13 games after sweeping McKendree and earning a midweek win over NAIA Top 25 ranked Southeastern. 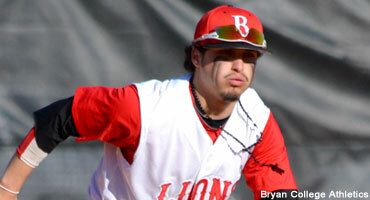 The Lions have big-time performers both on the mound and in the lineup that have propelled them into the rankings. Ace Liam O’Sullivan is 4-0 with a dainty 1.20 and has racked up more strikeouts than hits and walks allowed combined (33 to 25). Cole Stancil has been powering the offense, batting .418 with five home runs to lead the St. Leo attack. Erskine did lose their final game of the week – their first set-back of the year – but not before outscoring their opposition 131 to 21 in the 11 games leading up to the loss. So far this season Flying Fleet pitchers have held opposition to a .179 batting average and have a 1.32 ERA. The Lions and Fleet took the spots of St. Edward’s and Armstrong Atlantic who remain on the cusp of rankings’ consideration. The top five teams in the NAIA rankings remained relatively the same, but two clubs did fall out of the top 10 after disappointing weeks. The Southeastern Fire went 1-3 on the week to drop to the 12th position, and Belhaven went 1-4 to slip down from seventh to 15th. Top-ranked Missouri Baptist did remain undefeated, but they also didn’t play any games for an opportunity to secure their position until Monday. MBU ran their season-opening win streak to double-digits before No. 21 Bryan handed the Spartans their first loss of the season. The current rankings are based on on-the-field action through Sunday, so those games don’t factor into this week’s positioning, but it does open the door for a new team to take over the top position next week. Oklahoma Baptist is the most likely candidate to find themselves at the top of the NAIA heap next Wednesday as they have been nearly flawless this season, starting the year 14-0. The OBU Bison pitching staff has been remarkable this season, striking out 120 batters in 102 innings while only allowing 65 hits. Kelvin Rivas has put up ridiculous stats this season that for all intensive purposes should be considering illegal. In three starts Rivas has pitched 18 innings and only allowed four hits while string out 33 batters. Whoa. The aforementioned Bryan Lions could also be in position to make a big jump next week after their win over top-ranked MBU. Lions’ hurlers have two no-hitters this season, their second being posted last week after Kenny Knudsen blanked the Taylor Trojans. Knudsen nearly had a no-no the week before when he game up three outs short against Madonna and has a 0.36 ERA with 41 strikeouts in 25 innings while only allowing six hits. Once again weather dramatically limited D-III play. Only seven of the top 25 teams were able to play a game last week, and most of them delivered as anticipated results, so there wasn’t much movement in the rankings. Top-ranked Emory raised its season-opening win total to five games before losing its first game of the season to Rhodes. Despite the setback, the Eagles maintained the top position. The win was fruitful for the Lynx however, as they vaulted from 25 to 16 on the heels of the victory combined with series losses by Linfield and Webster. Third-ranked Birmingham-Southern also continues to impress this season. The Panthers went 3-0 on the week to secure their spot and would likely take the No. 1 position should Emory falter this week.